Habitat: Desert, Upland. It is usually found growing in or along dry, sandy washes or in other areas with loose, dry soil. Description: The flowers open for only a very brief time around dawn, so it can be difficult to capture them blooming. 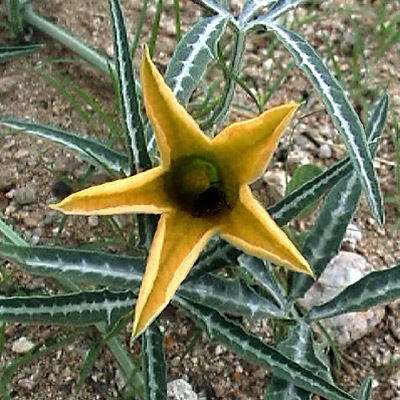 The star-shaped flowers have 5 pointed lobes and are broadly tubular and 2 inches (5 cm) long. 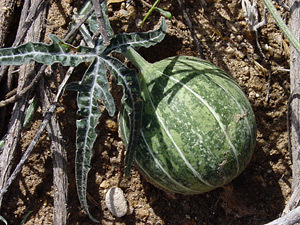 The flowers are followed by round, green gourds with vertical, white stripes. The gourds turn yellow and then solid tan as they dry. The leaves are green and palmate with 5 finger-like, white-veined lobes.